Size: 5.0" x 2.7" x 0.35"
The Canon Palmtronic LC-83M continued the spirit of the original LC-8M and LC-81M but introduced the Algebraic Operating System (AOS) developed by Texas Instruments with the SR-52 already 10 years ago. Try this calculation on your four banger: 2 + 3 * 4 = ? The LC-83M gives you the correct answer of 14. Together with the unusual functions 1/x and pi() the LC-83M is borderline to scientific calculators. 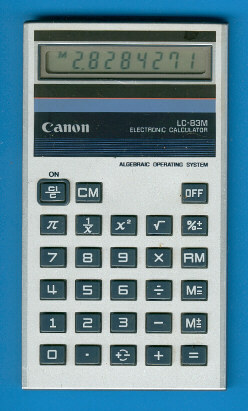 Later production of the calculator was shifted to Taiwan and the appearance slightly changed. Please watch the smaller display of the LC-83MII.